A Crabeater closeup. 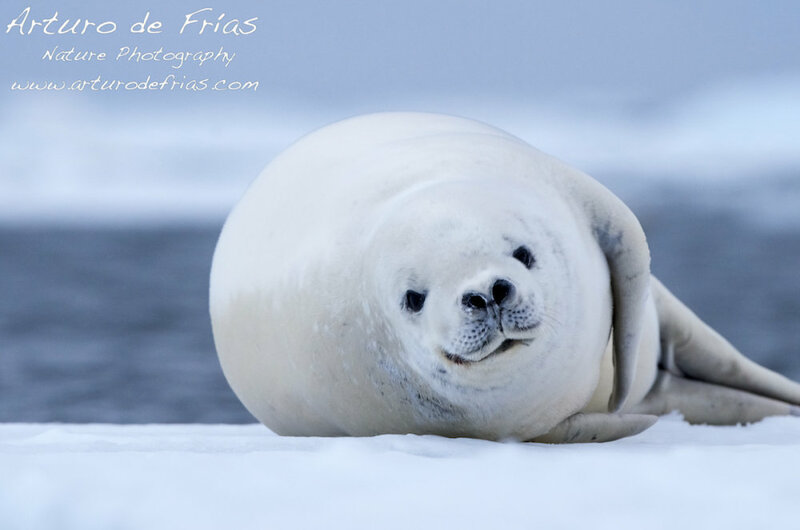 These are in my view the most beautiful antarctic seals, with their big liquid eyes and their light grey fur. Crabeaters are one of the most abundant mammals on Earth, with some estimates suggesting up to 75 million individuals. Their main habitat is the free-floating pack ice around the Antarctic continent. Their name is in fact a misnomer: they feed on krill (the shrimp-like crustacean that is the base of the whole trophic chain in the polar regions), not on crabs. Primer plano de foca cangrejera. Estas son las focas mas bonitas, con sus grandes ojos negros, y su piel casi blanca. Este es uno de los mamíferos mas abundantes en el planeta: algunas estimaciones sitúan su numero total en torno a los 75 millones. Su habitat principal es el hielo oceánico que rodada al continente antártico. Su nombre, traducido del ingles, es en realidad erróneo: estas focas no comen cangrejos, sino krill, el pequeño crustáceo que es la base de la cadena trófica en las regiones polares.